Perhaps the best half day hike near Crater Lake is the 2.5 mile route to the isolated summit of Mount Scott, at 8,929 feet the highest point in the park and for many miles around, hence the views from the top are very extensive. There are no intermediate peaks nearby to block the vista, which extends 100 miles south to Mount Shasta in California, and 85 miles north to the Three Sisters. 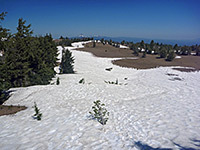 The trail is steep in places though not difficult during the three months of late summer/early fall when the slopes are free of snow; for most the year, like the majority of the Crater Lake backcountry, the mountain is quite inaccessible. One of the park's two fire lookout towers is built on the summit (staffed only when fires are expected), and a few small trees grow here, so there is no 360° panorama from a single point, but this doesn't detract from the amazing spectacle. Crater Lake itself is clearly visible, albeit rather distant (2 miles), since the peak is set back a way from the rim, although an elevated, close-up perspective of the crater is easily obtained from many overlooks along the Rim Drive; instead, Mount Scott offers a great overview of a much wider area. 10 views along the Mount Scott Trail. A pullout along the Rim Drive near Cloudcap Junction marks the start point for the Mount Scott Trail. The summit dominates the skyline to the east, guarded by a smooth, very steep scree slope below, holding some snow all year; high above, a gently sloping ridge extends southwards, and curves round to the west, providing a relatively easy route up. Snow lingers longest on the lower portion of the trail, as the land here is partly forested and shielded from the sun, while further up, the path crosses south-facing slopes where all ice melts in early summer. The path starts across flattish, open, pumice-covered land then soon enters the hemlock/pine woods, following the ridgeline due south then turning east after a mile and leaving the forest, crossing earthen slopes bearing many summer wildflowers. 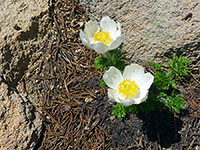 Species include red paintbrush, purple lupine and yellow pasque flower. Mount Shasta and Upper Klamath Lake are now visible, to the south, though most of the middle distance is rather featureless - uniformly wooded terrain, fairly level, with just a few lesser volcanic peaks rising a little way above. 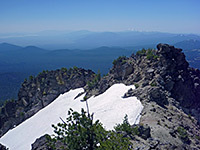 The trail cuts back west and starts a series of switchbacks, where snow may persist quite late in the season, and the views change to the west; down the steeply-sloping cirque beneath the mountain, and across to Crater Lake. 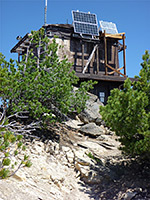 The steep section ends when the path reaches the summit ridgeline, where a short off trail walk leads to a rocky summit at the south end, while the path heads north another quarter of a mile to the main peak, which is also formed of bare rock, and is home to the watchtower. No part of this is open to the public but there are plenty of places to sit and appreciate the scenery nearby. Now the whole area is in view, and the panorama covers over half of Oregon's Cascade Range, from the distant, glacier-topped summits in the north to Crater Lake and the Rim Drive close by.